In comparing the offensive or attacking strength of two ball clubs the question of base running is not much less important than that of hitting. The club which gets men on bases and can't get them around is no better off than the team that can't get them on. Base running today is a highly cultivated art, but in spite of the attention paid to it managers have never been successful in making great base runners out of men who have not the natural ability. Cobb is an example. There are many men in the league who are faster, but his natural inborn ability makes him the greatest of all on the paths. 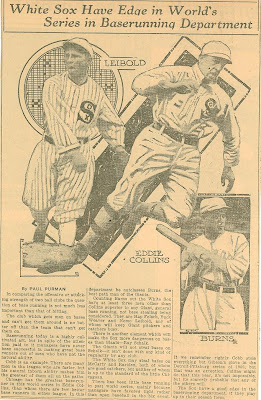 Chicago has the greatest base runner in this world series in Eddie Collins, than whom there are few better base runners in either league. In this department he outclasses burns, the bes path man of the Giants. Counting Burns our the White Sox have at least three men other than Collins superior to any Giant, general base running not base stealing being considered. They are Hap Felsch, Buck Weaver, and Nemo Leibold, any of whom will keep Giant pitchers and catchers busy. There is another element which will make the Sox more dangerous on bases than Giants - Ray Schalk. The Giants will not steal bases on Schalk - it isn't done with any kind of regularity by any club. The White Sox may steal bases on McCarty and Rariden, both of whom are good catchers, but neither of whom is up to the standard of the little Chicagoan. There has been little base running in past World Series, mainly because managers have favored tight rather than open baseball in the big event. If we remember rightly Cobb stole everything but Gibson's glove in the Detroit Pittsburgh series of 1909. But that was an exception. Collins might do that this year, it's not impossible, but it's scarcely probable that any of the others will. The Sox have a good edge in the base running department, if they play up to their season form. From the Rock Island Union. 1917.